How to replace flipping folio with single page initially? If the flip page is wide, you could think about make only one page shown in front of readers initially. Because you know that two sides both shown will make it ugly. Due to the pursuit of perfection, you really want to make it look better. You are a good publisher for your audience. Your customers like you because you are considerate and make their eyes comfortable. To switch double page shown to single page, you please read the below easy tutorial. 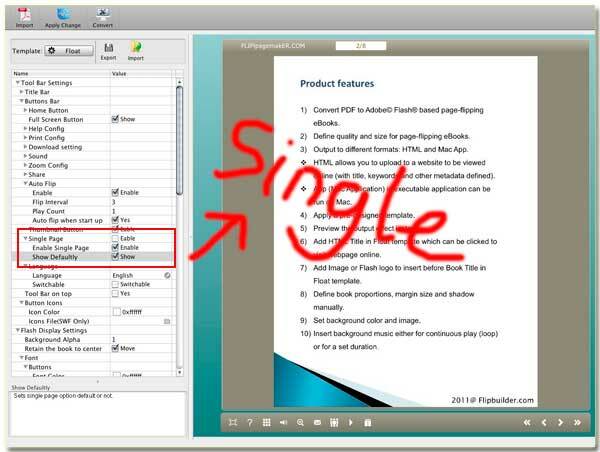 Step1: Start our practical tool FlipBook Creator for MAC, import a wide page PDF file will make you understand well. Step2: Yes, wide pages make the book look odd, so you’d better to change the double single. Hover the mouse to the left settings and then find the options Enable Single Page and Show Defautly. Don’t forget check them and then click the top Apply Change. After above settings, you would find single page shown on the flipbook panel, you can scroll mouse to slide it. But at present, it only support slide. Anyway, it becomes more suitable than the wide ugly pages. Note: Here we adopt the template of Float to explain how to setup single page.